Getting a China Tourist Visa is a fairly simple process, you can apply one in most Chinese embassies or consulates around the world. It is extremely important that you do not to write "Tibet" on your application! If you write "Tibet" on your China visa application, the embassy or consulate will tell you to get a Tibet Travel Permit first in order to process your visa. The truth is, the Tibet Tourism Bureau will not process your permit application without a China visa, you will end up in a limbo of Catch 22. Tibet Travel Permit was restricted during my visit to China, restriction was initially make effective only on the first week of September and expected to be lifted on the 12th of September, however, it delayed until the 20th September. I didn't make it to Tibet, this is not quite the "roof of the world". 4. There are some nasty cab or private car drivers, increase transport fare mid-way, scold them! 5. If can, get a local phone number to make Uber available, it'll change your life in China! Tibet has had a tumultuous history, it spends partially of its periods as independent entity and others ruled by the mighty powerful China and Mongolian dynasties. During the 1950s, thousands of troops were deployed by China to enforce its claim on Tibet; the inner Tibet became the Tibetan Autonomous Region and the borders were incorporated into neighbouring China's provinces - the "Greater Tibet" (Qinghai, Gansu, Sichuan and Yunnan). During the China's Cultural Revolution in the 60s, most of the monasteries were destroyed, thousand of Tibetans are believed have been killed during the periods of repression and martial law. It's not hard to see why, the strict policy on Tibet Travel Permit. When my Tibet's plan fell through, contingency plan is to explore the borders of Tibet - edge of Tibetan Plateau and Kham Region of Sichuan. 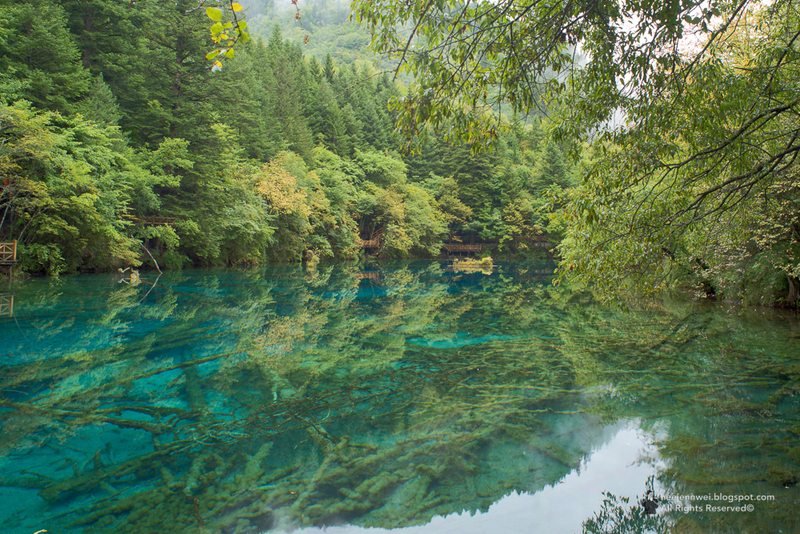 I always wanted to visit Jiuzhaigou, but its reputation of overflowing tourists somehow constantly repulsed my thought. Ohh what the heck! 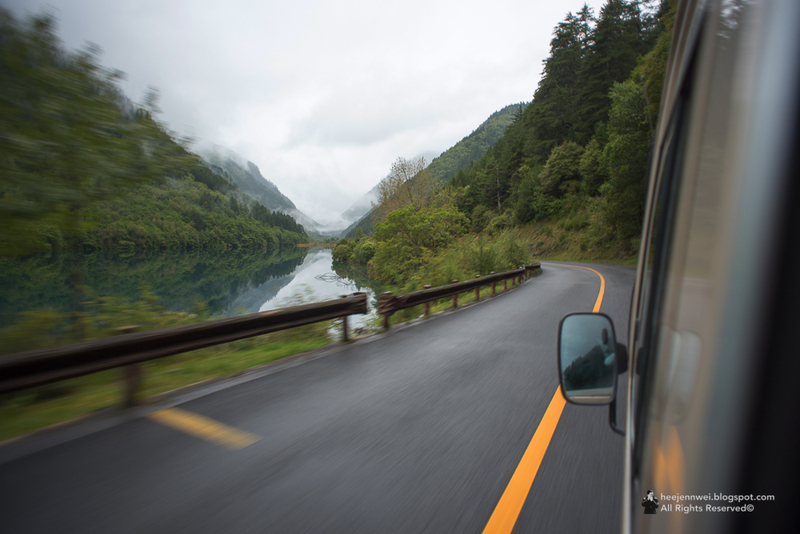 The next thing i know, i found myself on a 11 hour bus ride to Jiuzhaigou. The bus spiralled its way up and down, like seriously a lot of ups and downs through the tree covered mountains draped with waterfalls. 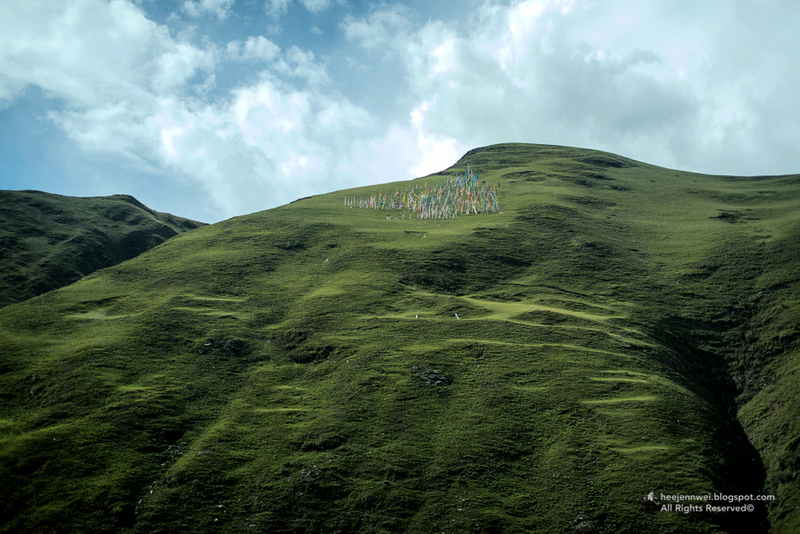 Tibetan praying flags sporadically wound up the the side of hills and fields of grazing Yaks over the terrain. I pre-booked my accommodation at Amami Homestay through Airbnb, a pleasant surprise. 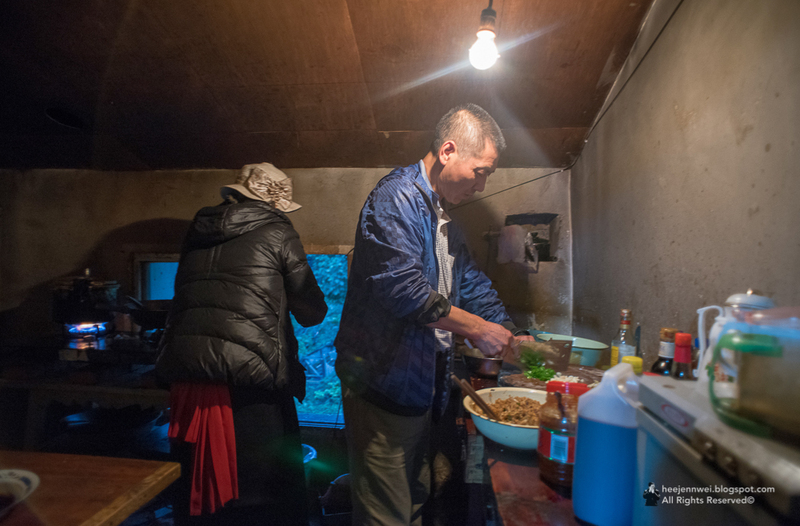 The host's mother emerged in a full Tibetan garb of fluffy red and white hat, a long sleeved white blouse and a small braids cascade over; they also invited me for a home-cook dinner, and didn't take extra charges, seriously, a pleasant surprise. 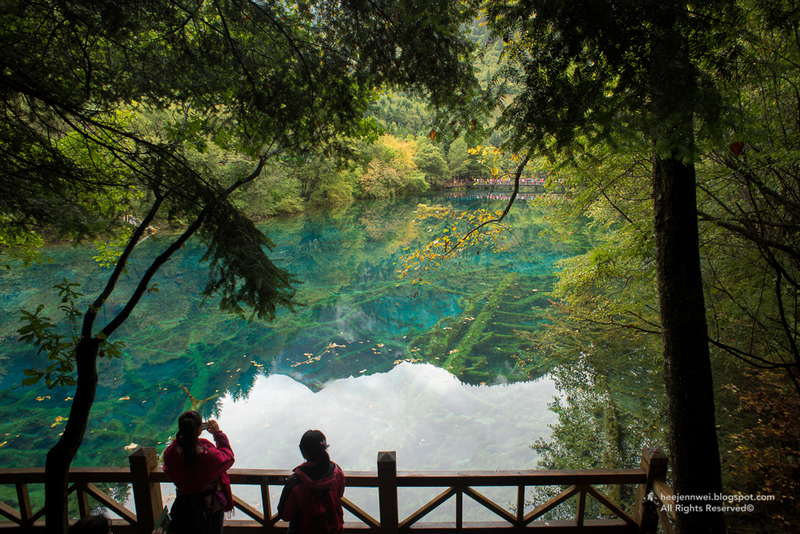 Jiuzhaigou Park ticket counter opens around 7.45am, go in as earlier and queue up for your entrance ticket. Entrance to the park opens at 8.00am, I got on to the first bus entering into the park. Ticket counter and park entrance open at 7.00am during peak season. 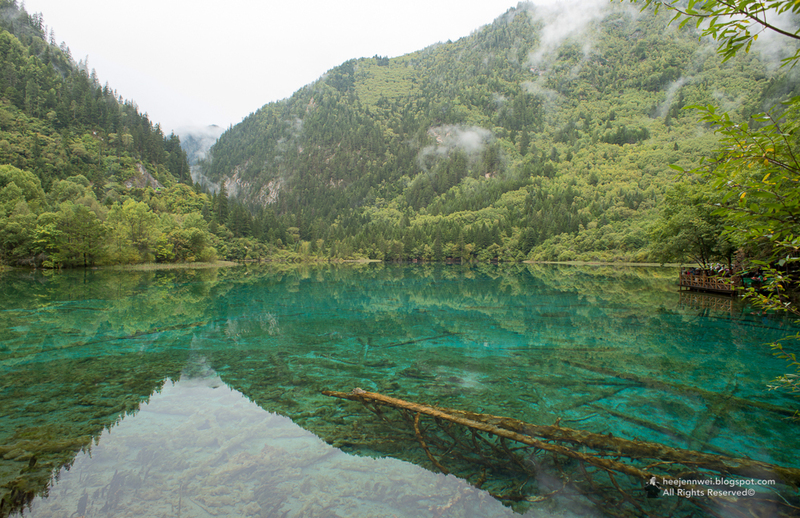 Jiuzhaigou Park splits in a "Y" shape; left point will get you to Changhai (Long Lake), right point towards Virgin Forest. Too avoid overwhelming tourists, I would highly recommend to go in by the Park Bus (towards Virgin Forest), slowly pace your way out from Virgin Forest towards Mirror Lake, then take the Park Bus to Nuorilang Restaurant, an intersection of both points, Changhai and Virgin Forest, from here you can take a rest and have your lunch, then follow the park bus towards the other "Y" point - Changhai. 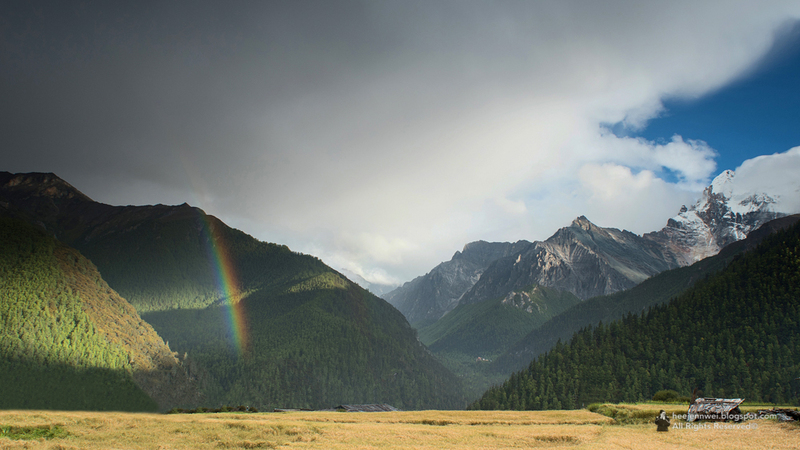 Jiuzhaigou means "Valley of the Nine Villages", home to 110 Tibetan and Qiang families. 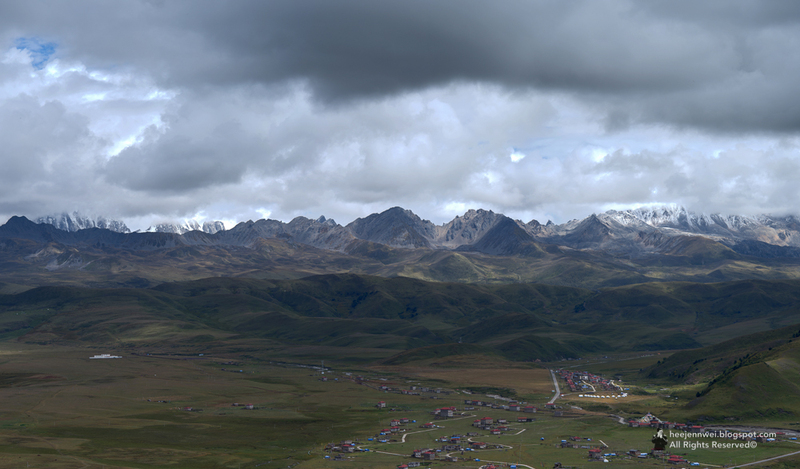 Part of the magnificent Min Shan mountains on the edge of Tibetan Plateau. Extravaganza of natural wonders, pure unspoiled land of waterfalls, alpine lakes, tranquil grasslands, snowy mountains views and Tibetan villages. Five Flower Lake, bottom criss-crossed by ancient fallen tree trunks. 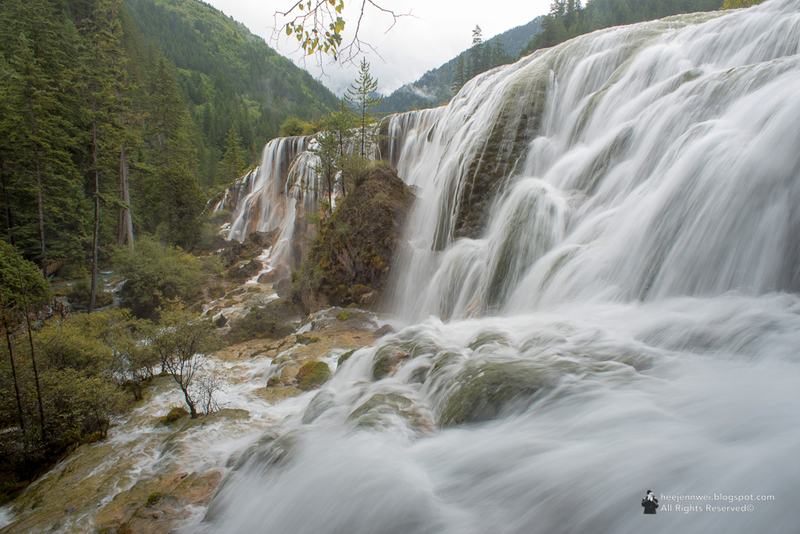 There are several waterfalls in Jiuzhaigou Park, Pearl Shoal Waterfall is the first of three waterfalls in the reserve trekking by foot. Amami's Homestay, you won't be able to find it on Google, try Airbnb. Tibetan Home-cook Dinner from the host. Jiuzhaigou back to Chengdu - towards Kangding, that's an 11 hours + 8 hours of bus ride. 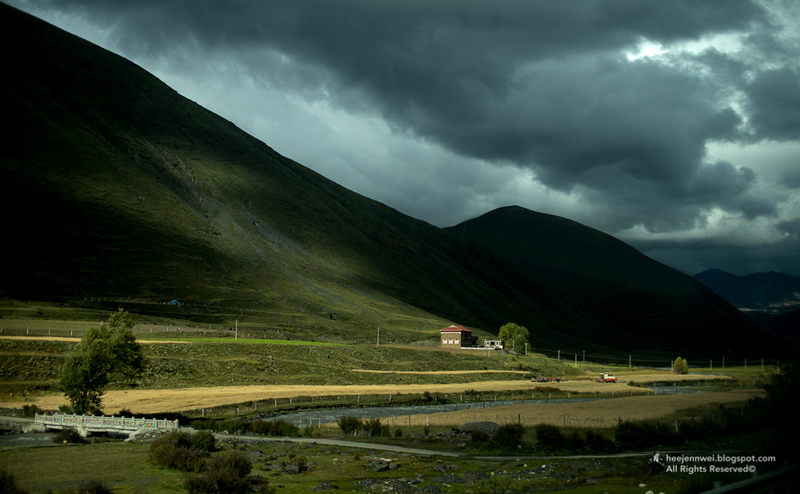 Kangding is a gateway to the Kham Region of Tibetan world - the wild wild west of Sichuan. It's highly recommended for travellers to stay for at least 1 or 2 days, as a buffer zone for high altitude sickness before the high plateau. Rest assure, there are enough to see and do to keep you busy for days. 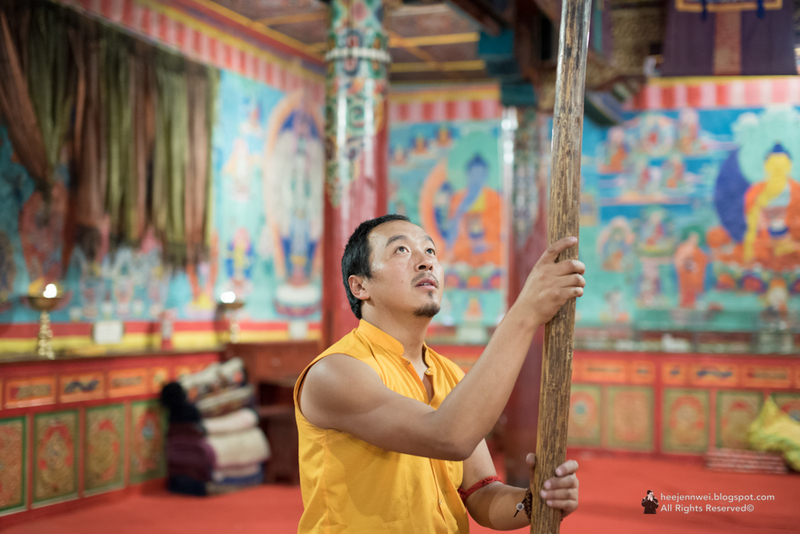 There are 4 monasteries in town (Ngachu Monastery, Lhamo Tse Monastery, Dordrak Monastery and Dentok Monastery). Not far outside the town, there's the high altitude lake of Mu Ge Cuo and the nomadic grasslands of Tagong. 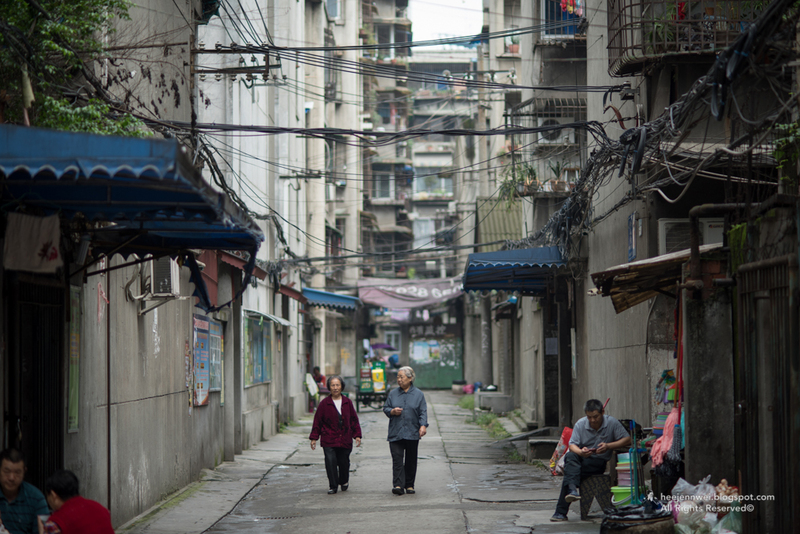 Kangding wasn't what i pictured, it's a concrete jungle overshadowed by towering mountains. A distantly out of town Zhilam Hostel is the best place to get away from the mid-sized bustling town and constant assault of car horns, also high enough for an uninterrupted views of monasteries dotted mountain. As we jolted our way towards the plateau, Tibetan prayer flags, and a scattered groups of Yak and nomad herdsmen began to appear. Tagong Grassland is 2 in a half hour away from Kangding Town, you can opt to stay at Tagong Grassland, Khampa Cafe & Guesthouse is a fantastic choice of accommodation. Clustered more or less around one main street, Tagong is a wild west sort of town populated almost exclusively by ethnic Tibetans, living bear the marks of life on the very fringes of Chinese society. Visible Peak of Paoma Mountain rises at 5,500m above sea level. 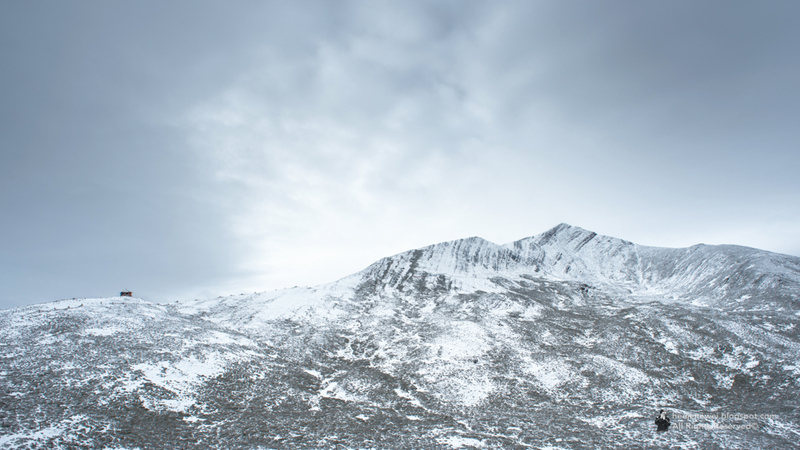 Snow Mountain at Kangding, at 4,280m above sea level. With the Tibetan nomad herdsman. 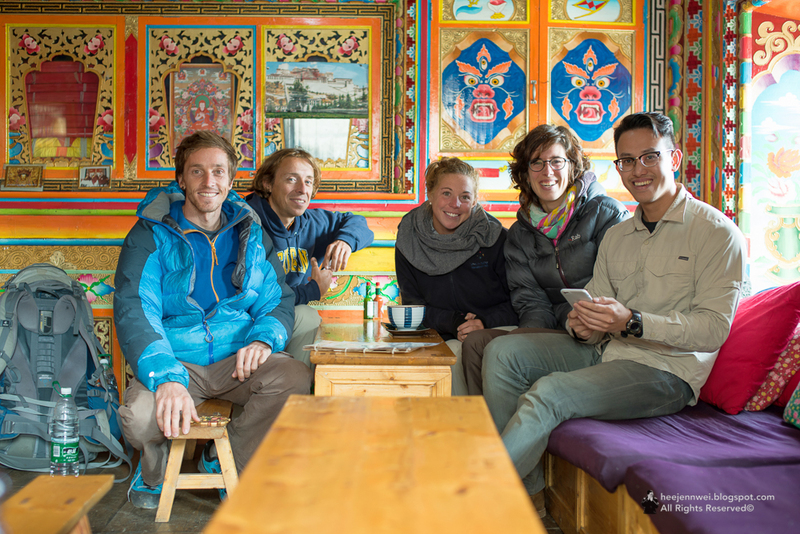 With fellow travellers (Michael, Brandon, Donna, Aline) i met at Zhilam Hostel, lunching at Khampa Cafe before our trek at Tagong Grassland. View of Mountain Yala from Tagong Grassland. A 1,000 years old Tagong Monastery right next to Khampa Cafe. The air constantly filled with the sound of flapping prayer flags overhead, and one gets the sense that religion and survival are the elemental parts of life there. 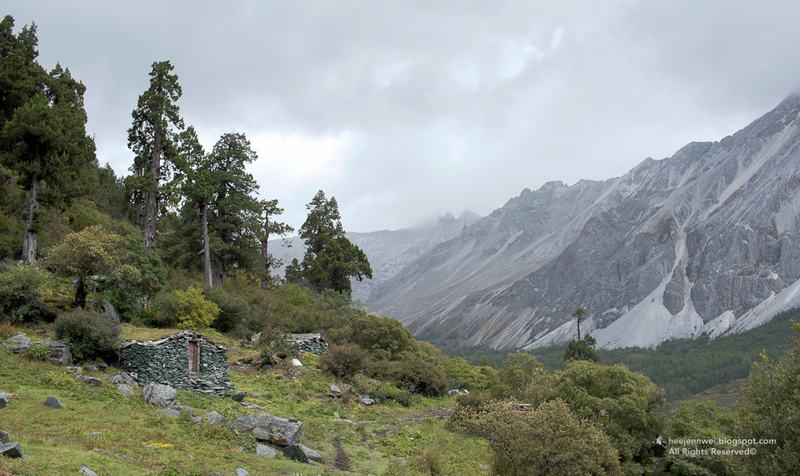 Nestled in a valley by a fast flowing water, at an altitude of 3,600m, it's tempting to think that James Conway had Tagong in mind for the fictional Shangri-la of Last Horizon. A gruelling 12 hours bus ride from Kangding to Daocheng, another 3 more hours from Daocheng to Yading Nature Reserve (Aden Scenic Area), closely edging the Tibetan's border, one of the most beautiful places on the Tibetan Plateau - the Kham Region of Sichuan. 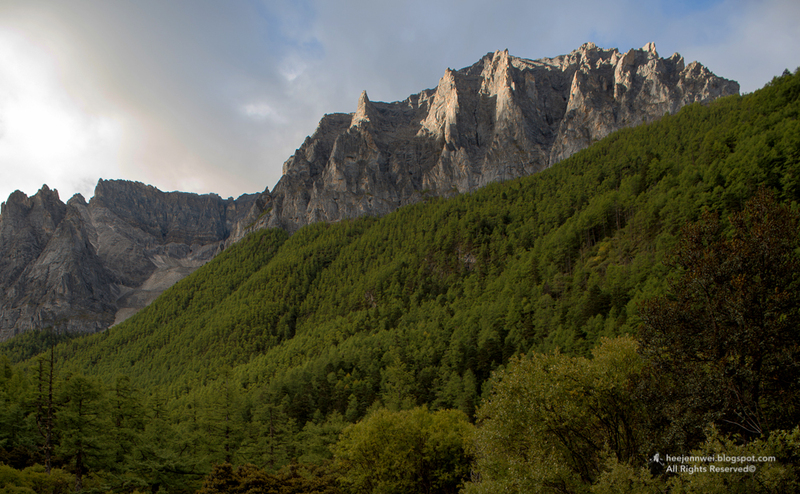 Here, you can opt to stay at Daocheng, Riwa (Shangri-la) or Yading Village (inside Yading Nature Reserve). 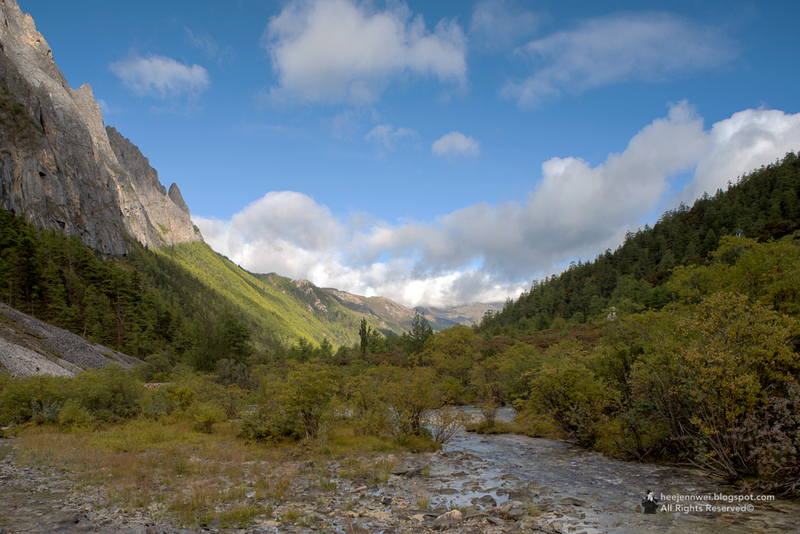 If you intend to go into Yading Nature Reserve several times for photographing or other purposes, i recommend to stay at Yading Village. You have to purchase the entrance ticket to Yading Nature Reserve in Riwa, beyond Riwa, no private/rented vehicle allow to drive beyond the entrance point, except for local traffic and Yading bus. 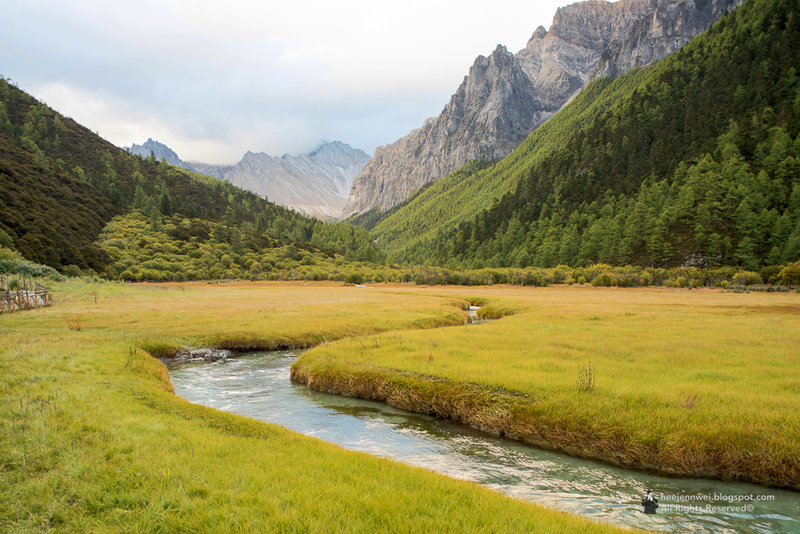 Yading Nature Reserve ticket is RMB150 per person and it's compulsory for you to purchase a roundtrip bus ticket for RM120 per person, a total of RMB270 per person, staying at Yading Village will save you the entrance fee if you're attempting several visits. There are numerous hotels and guesthouses built along Daocheng and Riwa; in Yading Village, there are several basic Tibet-style guesthouse with clean rooms and basic Tibetan and Chinese dishes; there is no accommodation beyond Yading Village. From Yading Village, you can take the Yading bus towards Yading Nature Reserve entrance (Chong Gu Monastery), it'll take you 30 minutes, buses run several times a day from 7am to 5pm, transportation to the entrance is very convenient. Some travel tips remain that you are able to hire Trekking Guide or Horse at Long Tong Ba, however as of Sept 2015 Yading bus no longer stop at Long Tong Ba, it went right into Yading Nature Reserve entrance (Chong Gu Monastery) where you can purchase tickets for electric cart (30 minutes ride) take you from the Chong Gu Monastery to Luorong Grasslands. Alternatively, you can walk from Chong Gu Monastery to Luorong Grasslands, i suffered from High Altitude Sickness, it took me 3 hours to walk. 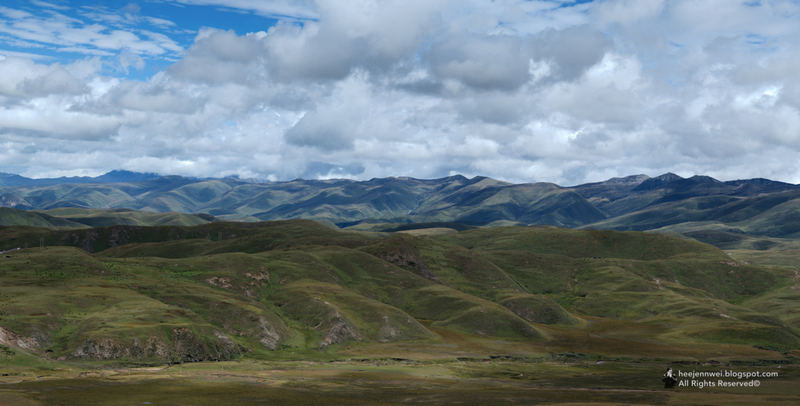 From Luorong Grasslands, you'll get an amazing view of all 3 holy mountains, Mt. Chenresig, Mt. Chana Dorje and Mt. Jampelyang. After Luorong Grasslands, there's a path from Luorong Grasslands towards Milk Lake and Five Color Lake. Mt. 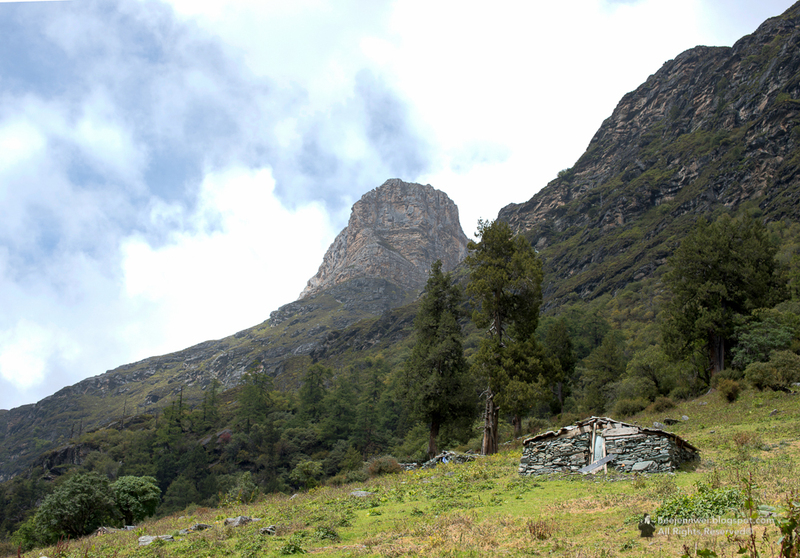 Jampelyang and Mt. Chenresig view from Yading Village. Distant view of Mt. Chenresig from Yading Village in the evening. From Chong Gu Meadow, no view of the snow-capped Mt. Chenresig, hiding behind the cloud. First rays of Sunrise shine on the rocky surface of sacred mountain. Many tourists will queue up for the electric carts, but you're not allow to stop for photo while on the cart. Trekking from Chong Gu Monastery to Luorong Grasslands is tiring but rewarding. Trekking from Luorong Grasslands to Milk Lake and Five Color Lake, the route is tough and difficult, trekking will take you 3.5 hours to walk; horse ride will take about 2 hours. Didn't manage to capture any picture of the Milk Lake and Five Color Lake, it was pouring rain awfully heavy! However, Milk Lake and Five Color Lake is as far as you can go on the route, you can opt to continue a pilgrimage circuit (Small Kora) around Mt. 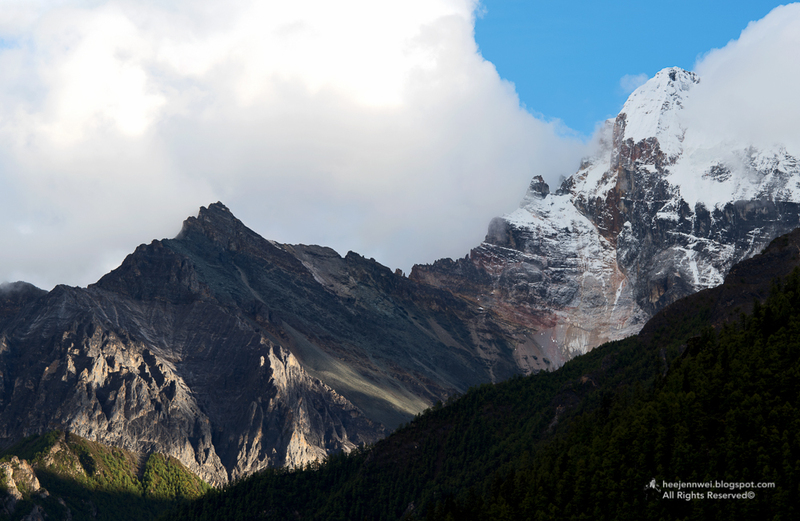 Chenresig, it's possible to trek in a long 12 to 14 hours, or 2 days to complete the Kora, no trekking guide or permit is required for the Small Kora route around Mt. Chenresig. However, you're required to get here with your own tents, sleeping bags, food and water. 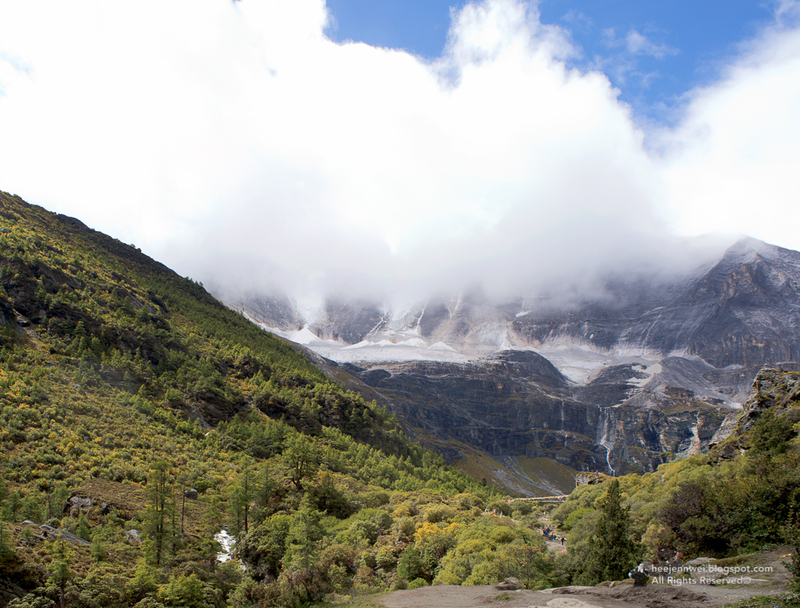 Alternatively, if you plan to do a longer trek (Big Kora), around all 3 mountains or Lugu Lake, it is highly recommended to get a guide with you. Guttural tones of clearing throat, vulgar as if someone about to hock a loogie; Excessive violent and loud amount of chatters, unreasonable queue cutting... massive amount of cultural shock. Of course, layover at Chengdu is inevitable, it's a transit portal to the Tibetan's world - and i have 36 hours to spare. This typical concrete jungle proudly own the most private cars in the country, traffic is awfully chaotic! Surely enough the resentment probably due the contrary of city and nature landscape. 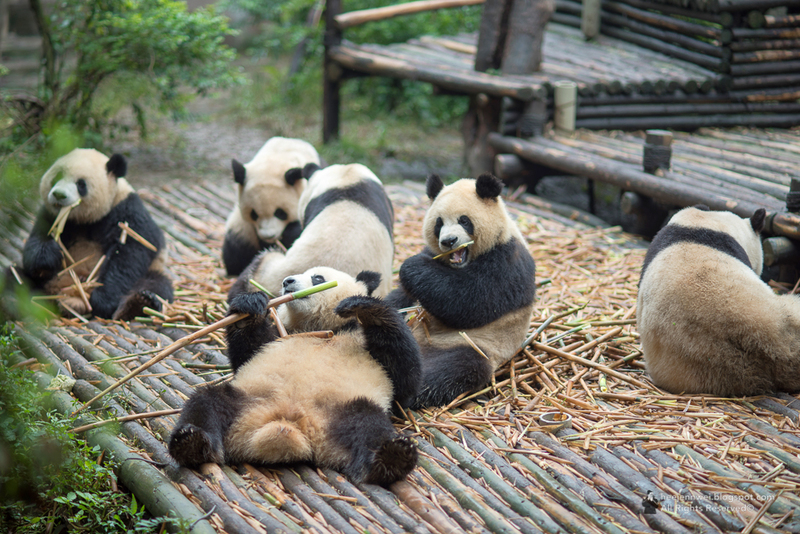 There are several things you can do at Chengdu if you have 36 hours here, cheap eats at the city's street, tea house, night of opera music and panda (overload)! A fantastic morning jaunt, make sure you get to the Giant Panda Breeding Research Base earlier, around 7.30 in the morning. Entrance fee is surprisingly reasonable, at RMB58. Lovely and huge sanctuary, various kind of bamboo trees planted along the pathway, very pleasant to stroll around, park shuttle service available for RMB20. The park has many different areas contain different stages of panda, from cub to adult; set in a very natural environment, as greenery as possible, in a cage. 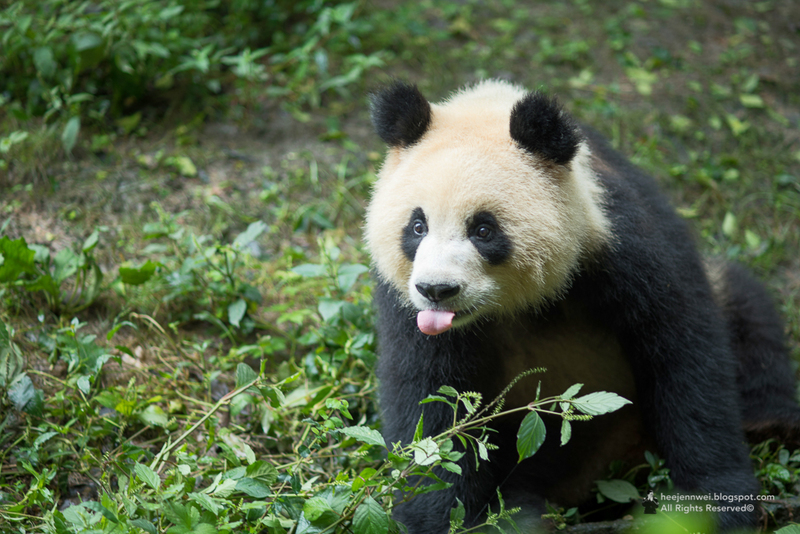 A sub-adult Panda giving the tongue! Foods are fed around mid-morning, it is also when the Pandas come to live. After meal, the pandas will be ready for their siesta and the show's over. After half a day at the Panda base, back to Chengdu town. Blaring falsettos and crashing percussions, this is not a show for everyone. 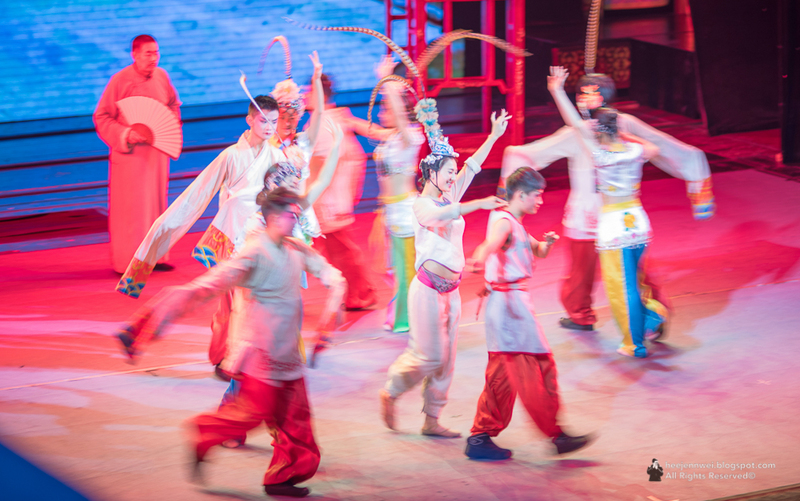 A taste of one of Chengdu's most famous and enduring art in an hour long performance, a thoroughly enjoyable experience, and it's not boring at all! 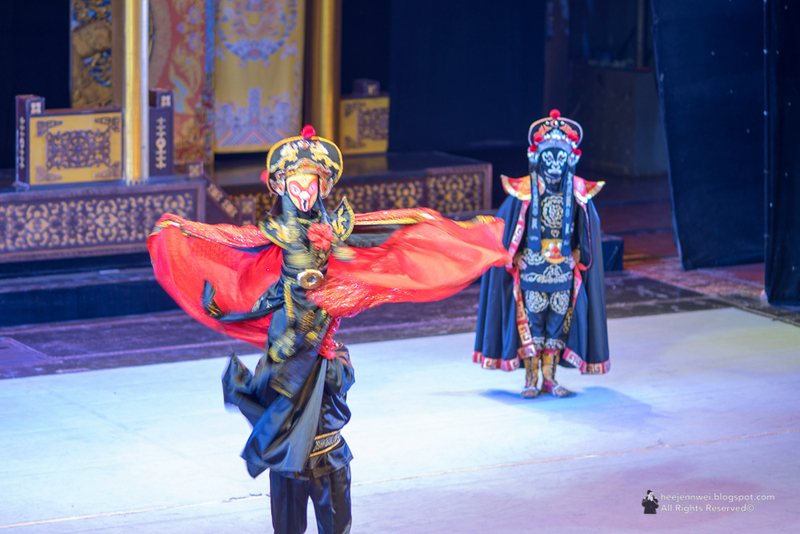 There are several theatres at Chengdu, Yuelai Teahouse (show starts at 2pm), Jinjiang Theatre (show starts at 8pm), Chengdu Sichuan Opera Theatre (not sure what time was the show, it was close when i went there around 7pm). 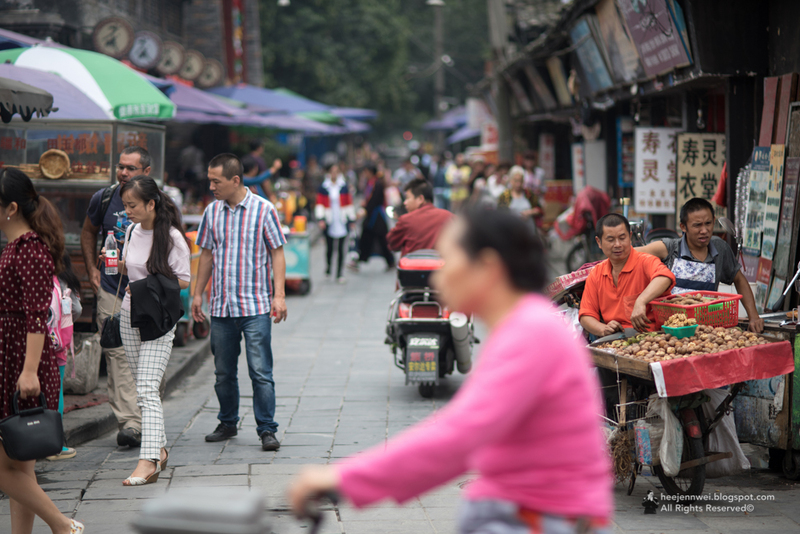 The next day, i spent my last 12 hours hopping around the streets of Chengdu. With a history of somewhat 1,400 years, the Wenshu Monastery is one of the most significant Buddha centers in China. Locals flock into the straggling complex of grey-tiled temples and the maidenhair-filled courtyard, incense from caldrons, slender iron-looking pagoda and prayers. A monastery reserved some of most ancient Buddha statues, complement along with paintings, calligraphy and a secret garden tea house. I actually walked from Xinnamen Bus Station to Wenshu Monastery, an hour stroll. Street food outside Wenshu Monastery, right next to the memorial hall. 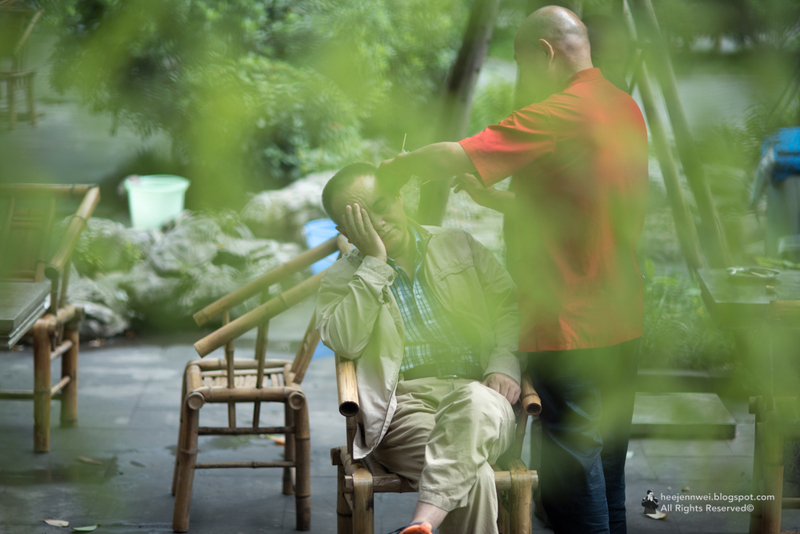 The Cai-Er (ear-picking) specialist goes around the tea house making bell-like sound from the fancy set of tools, looking for customer. This is unlike any urban tea/coffee house; laid back, all walks of life eating, talking, playing cards and drinking tea. 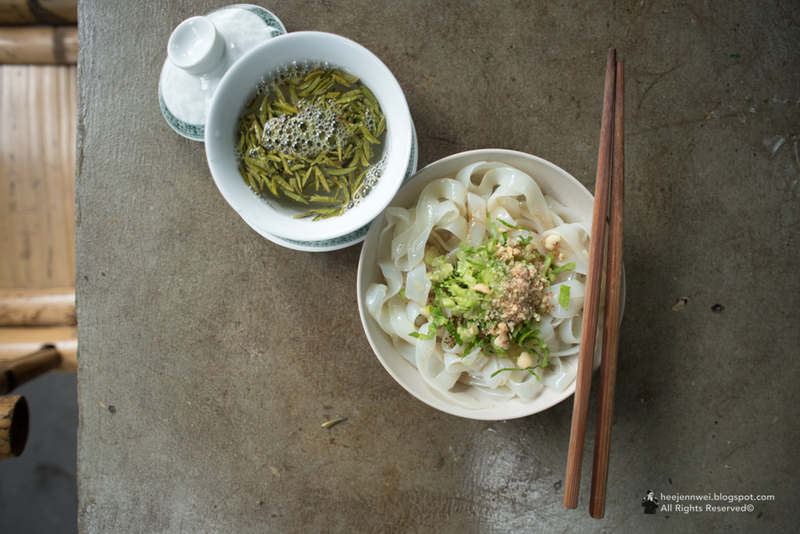 My cup of Bamboo Leaf tea and vegetarian noodle. 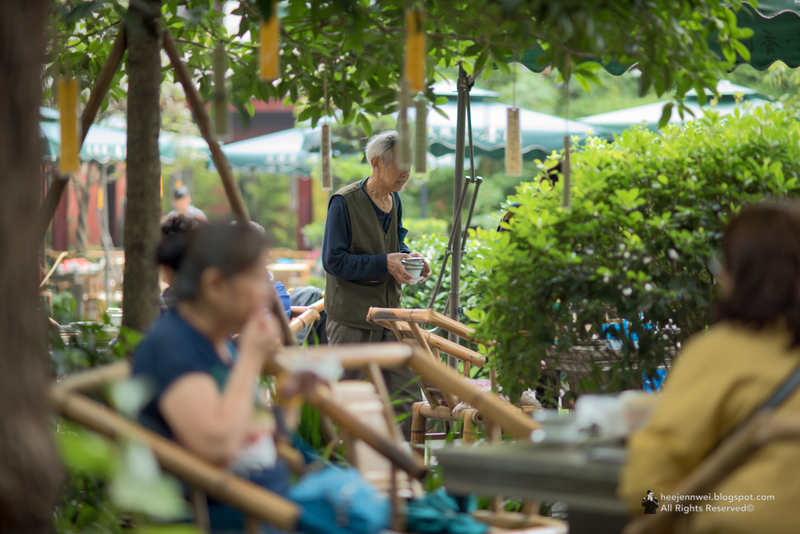 An all round great place to hang out in Chengdu, peaceful and quiet - a great spot, to be inspired. The conjures of monks, meditations, mountaintops; blue skies, red robes. The reality of Tibet that it is one of the least travelled areas in the world. 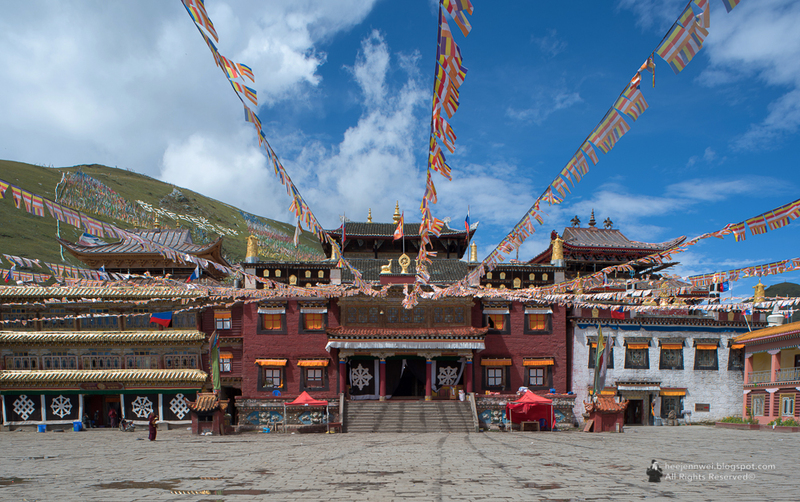 The entrance to Tibet spend most of its time closed than open, if permit happened to be restricted during your visit, experience Tibetan's culture is not impossible, most of the Tibetans' homeland extends into the "Greater Tibet": prefectures in Yunnan, Sichuan, Gansu and Qinghai. In fact, the Greater Tibet is twice the size of Tibet and 60% of the ethnic Tibetans live in these prefectures than in Tibet. The escape is imminent, i can almost feel it on the horizon as if fettered down into a workload of ridiculous proportions. 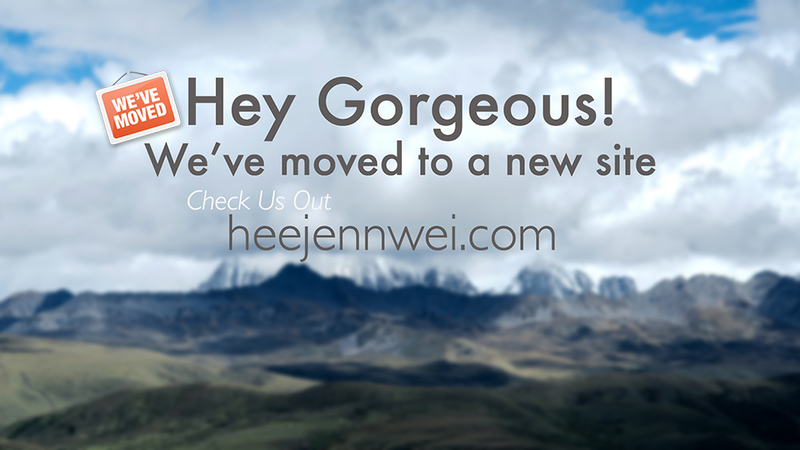 I almost wanted to set out my out-of-office reply to something like, "Sorry, i'm away exploring the highland of Tibetan Plateau and drinking yak butter tea...hahaha!" 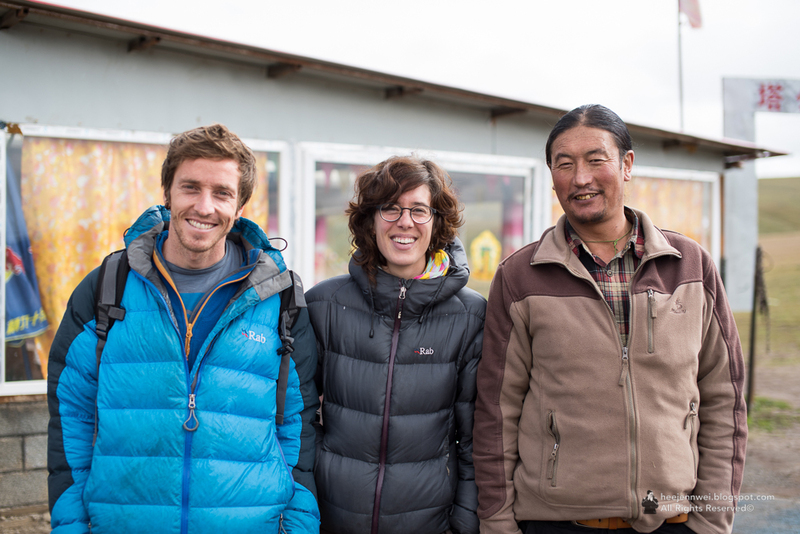 What an adventure it was, Tibet Travel Permit restricted a week before departure, improvise and makeshift plan to the Tibet's border. The history and culture of Greater Tibet is richly rewarding, the kind and friendly people, the awe-inspiring landscape, an incredible introduction of Central Asia and Himalayan culture. 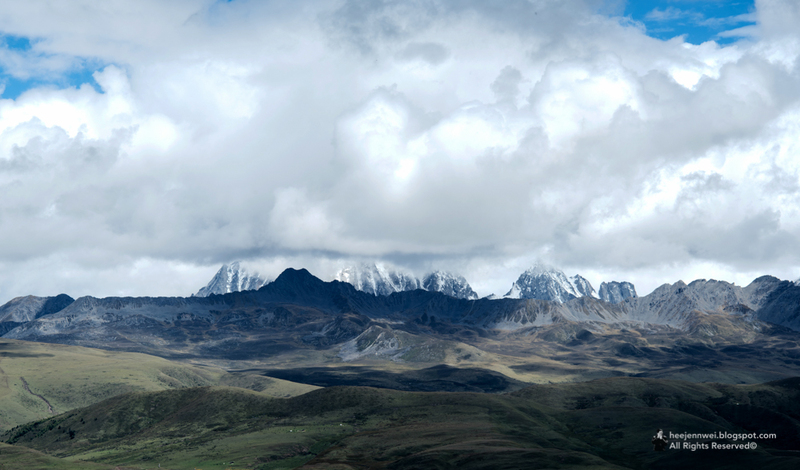 Spent an epic proportions of time battling High Altitude Sickness, one difficult to do as solo backpacking in a part of the world with a hanging cloud of uncertainty. 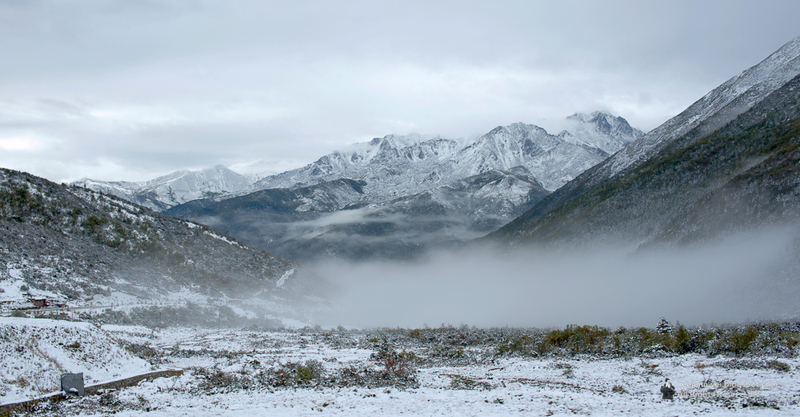 The mystical power of the mountain range, wrinkles of nomad herdsmen' weather battling, sense of knowledge and strength in the chants of monks and the calmness of Monasteries. There is, the passion and purpose. A place of spiritual experience for the enlightenment of soul, enhancement of life. THERE IS NOWHERE ELSE IN THE WORLD LIKE IT, GO AND FIND OUT FOR YOURSELF.